Project staff envision a 'core' area of a few blocks within a larger town center planning area. The finalization of a draft master plan for downtown Cornelius is still a few months away. But residents, businesspeople and other interested parties got an early look at what city officials and project staff are working on at an open house Wednesday, Jan. 9. The city invited people to come to Centro Cultural de Washington County on Wednesday evening for a presentation and displays, including maps of the town center area and proposals for improving pedestrian access, calming traffic, encouraging investment, creating public spaces and more. The planning project started last summer and is expected to continue through most of this year. Through creating a master plan for the downtown area, city officials hope to get a clearer picture of what residents, downtown businesses and organizations, and expert consultants think would improve Cornelius' town center, as well as assemble a roadmap for how to implement those changes. A major part of the plan involves redefining what exactly is considered the town center area of Cornelius. 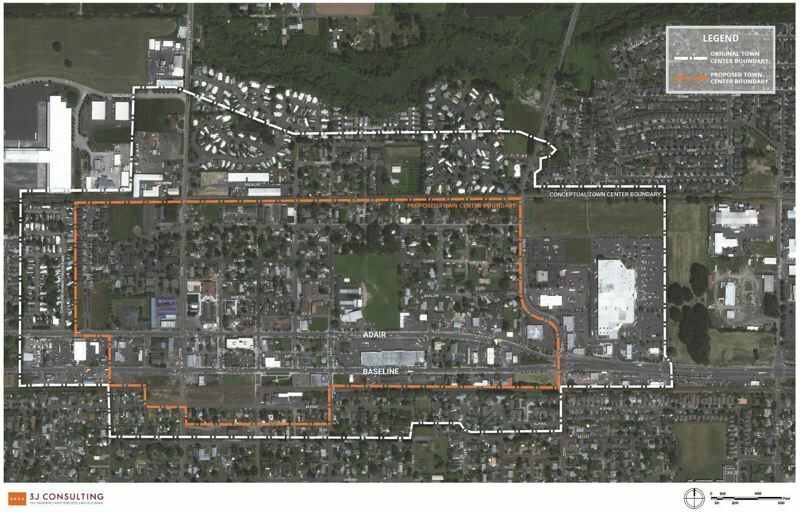 The city has been using a definition for close to 20 years that encompasses several blocks of residential neighborhoods well to the north of the Highway 8 couplet that runs east-west through town, the Fred Meyer shopping center further toward Hillsboro, and mobile home parks further toward Forest Grove. A svelter, more refined town center area was among the exhibits at Wednesday's opening house, with its northern limit in between North Davis and Fremont streets; its southern limit just south of Baseline Street or, in between Ninth and 14th avenues, Alpine Street; its eastern limit along 19th and 20th avenues; and its western limit just east of the Cornelius Manor trailer park. That area itself is sectioned up, said Steve Faust of 3J Consulting, which the city has contracted for work on the project. 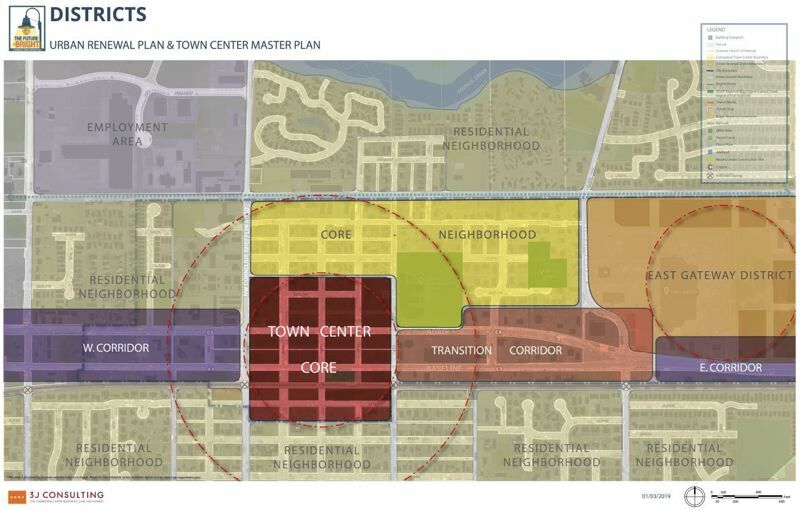 It includes a "town center core," approximately square in shape, focused between 10th and 14th avenues. That core encompasses key downtown buildings like Centro Cultural, Virginia Garcia Memorial Health Center, St. Alexander Catholic Church, Cornelius City Hall, the Cornelius Public Safety Building and Cornelius Place, which will be the new home of the city's public library. "Planners, we like to think of that quarter-mile radius … as neighborhoods," Faust said, showing the audience maps of Cornelius with red circles representing those areas superimposed over it. "This core area here is about an eighth of a mile radius, so a little bit more focused." The long-range vision for the Cornelius town center, as presented by Faust and city community development director Ryan Wells, includes redeveloping or otherwise repurposing "opportunity sites," like the disused Western States Fire Apparatus and Grande Foods buildings along Highway 8, as well as creating a more cohesive "neighborhood" feeling to make the town center area a more identifiable, vital and attractive part of the community. "What we hope for, I guess, is when you're driving down the highway, when you enter downtown Cornelius, you want to feel it," Faust said. "You want people to instinctually slow down and want to see what's on either side of the street. You can feel you're entering a place that you might want to spend some time." Cornelius has among the lowest household median incomes in the Portland metropolitan area, and its highway corridor bears signs of blight, with shuttered storefronts, dilapidated houses and even a derelict gas station. While part of the town center master plan's goal will be to improve the streetscape of the area — building on the work that has been done to improve Baseline and Adair streets and, more recently, 10th Avenue — Faust said project planners want to be sensitive to downtown's denizens as well. "Nothing we do here is going to force people out of this area," Faust said. "We really want to make sure that current uses are able to keep on with those uses in the long term. So as we make changes, we're going to be working with any property-owners who are interested and make sure that what we propose is sensitive to their unique situations." While the redefined town center area cuts out the commercial area around Fred Meyer, city officials still hope to see that area become a somewhat more walkable, modern shopping district. But Wells said they won't push redevelopment, instead letting it happen at its own pace. "We can help set the conditions to encourage development on that property, but the city's not going to compel anything to happen until there's a development trigger to improve that site," Wells said. Cornelius is going through a period of major growth — not the first since the city incorporated in 1893, as historical maps Faust displayed at Wednesday's open house showed, but one that is nonetheless significant. The Laurel Woods neighborhood now under construction in the city's southeastern corner is the largest planned development in Cornelius' history, according to Wells, and is on track to add about 900 single-family houses and townhouses to the city's housing stock. "From our perspective, what a town center needs as much as anything … to thrive is people to spend time there," said Faust, responding to a question from the audience about how that residential growth correlates with the downtown planning project. "While I think there's a lot of considerations for the city as a whole as these new residents come in … for our town center, it's mostly a positive thing."